I’ve been using the moniker “my TC” or just “TC” to refer to my, well, TC, for so long that I sometimes forget what it originally meant or why I chose those initials in the first place. Taking a trip down memory lane (and into my archives), “TC” actually stands for “travel companion”, a label I originally made up so I could mention TC when he brought me to visit Salt Spring for the very first time (March 2011). Even though we hadn’t gone abroad or anything, I needed to invent a label because at the time, TC was not my boyfriend, technically. It was all about convenience. That I would shorten it to “TC” and continue using the term a year and a half later. That a year and a half later, my TC and I would still be making little travels ’round the province/country together, and living together, and being in love. You see, I wanted to be practical. I needed a label–I found one. I liked TC and enjoyed his company. And I respected him. So sure, let’s go to Salt Spring, I could really use a weekend away. My heart was feeling grey and pinched in the grey and pinchy city. Away, away! And then–ocean. Space. Looming rocks and weather-beaten piers. And then–a small yellow-painted cafe. Tea. TC’s fun Australian aunt and two little cousins lifting big shy eyes to look at this new lady (me!). And then–a house with a fireplace and full of books. The girls’ shyness falling away and sudden overwhelming energy taking its place. Sock puppet shows and board games. Scotch for the adults. Bed for the girls. Reading Goodnight Moon to TC’s (then) four-year-old cousin and nearly crying over it. Telling TC that I was glad he brought me here because now I knew the hard choices I’d made in my life thus far were the right ones. 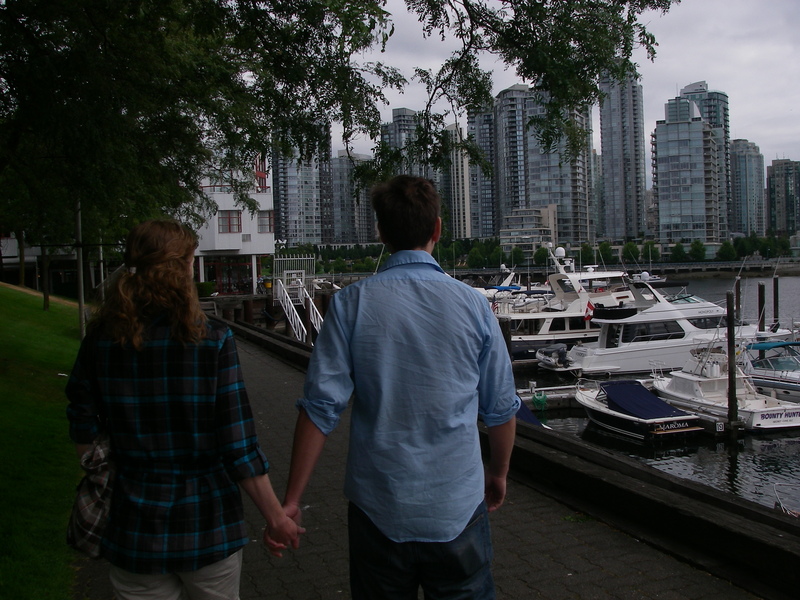 The second time we went to Salt Spring, I needed it badly then too. I’d heard only two weeks before that one of my childhood friends was gone–suddenly, tragically, irreversibly. I snuck away to look at the view and have a cry. TC found me and sat quietly with me until I was done and I had to go inside to change because there was tree sap on my pants. During our third visit to Salt Spring, TC and I acknowledged that we were officially “in a relationship” with one another, not that we hadn’t been unofficially for months anyways. By the our fourth visit to Salt Spring, TC and I were officially “in love”, not that we hadn’t been for months anyways. I watched a blood red sun rise over the Gulf Islands. TC was sleeping so I shared the moment only with a little brown rabbit who was hopping by. I was terrified by the idea that because my TC loved me, it was possible for me to hurt him. Could I continue under the threat of this possibility? The thought stopped my heart. By our fifth visit to Salt Spring, I had moved in with TC and his rabbit, who has an actual name, but whom I prefer to call Bunny. I had returned from my month travelling in Europe by myself, and I knew that TC was a choice I wanted to make. Everywhere I went, I had carried him with me, and at the end of that month we were carried back to each other. 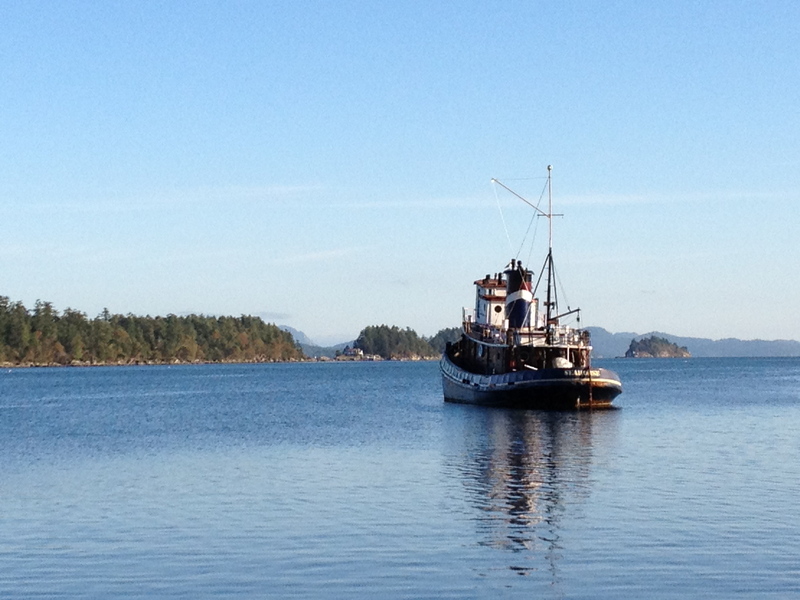 We visited Salt Spring for the sixth time in April. Spring was busy this year–sometimes I would have only 15 min at home after work to change or grab a bite before rushing off to class or a rehearsal. During these times my TC would have a grilled cheese sandwich waiting for me so I wouldn’t starve. I never slept enough. I was irritable most of the time. Emotionally I was very fulfilled but mentally and physically I was exhausted and feeling grey and pinched in the grey and pinchy city. And then–ocean again. Playing “C is for Cookie” on the ukulele with the girls. And then–a silence so present and soothing I slept for ten hours. Waking up and drinking tea in the sun on the back deck. So much fresh air I begin wondering how I could ever breathe anything else. August. Our seventh Salt Spring visit. This one a little more hectic than usual, much of it spent helping TC’s parents move into their new summer house on the island. The sunny window seat in the dining room is dubbed “Lauren’s Spot” because I spend as much time as possible there, napping or telling stories to one of TC’s cousins. I’m struck with the realization that I have been accepted into TC’s family–they like me and care about me. Suddenly, in addition to my beloved own, I have a whole other family who wants the best for me. It’s such a gift and such a responsibility. Labour Day weekend. Visit number eight. Through the window of a little Salt Spring Air float plane, my TC and I wave to his parents and (visiting) grandparents who are waiting on the dock and step out of the plane into a flurry of hugs. This time, I’m not visiting the island merely to be rescued by its beauty and tranquility. Sure, we’re a little sleepy from our early flight but our eyes are bright and our hearts are smiling. This time, no euphemisms or nifty monikers are required. I know just what to call my TC. On his own, he’s a lot of great and interesting things. To me, he is my partner in everything, my confidante, my support, and my best friend. But to use a quick term, I’ll just call him my fiance.